Birria is one of the classic dishes of Mexican cuisine. It is made in every home and for sale at roadside stands the length and breadth of the country. It is classic food-of-the-people. Elegant is not the first word that comes to mind after hearing the word “birria.” Maybe it should be. In Jalisco (think Guadalajara), where the dish is from, Birria is classically made from goat meat. There’s a reason Guadalajara’s top soccer team is called “Chivas” (the goats). Goat meat is slow braised in a rich broth spiked with cinnamon, clove and vinegar, yielding a thick, rich and utterly exhilarating stew. Birria can be made with just about any red meat. While goat is the most classic meat for birria in Jalisco beef is also common. While goat may be a little bit challenging for the American palate, beef is less so and is an excellent – and readily available – substitute. 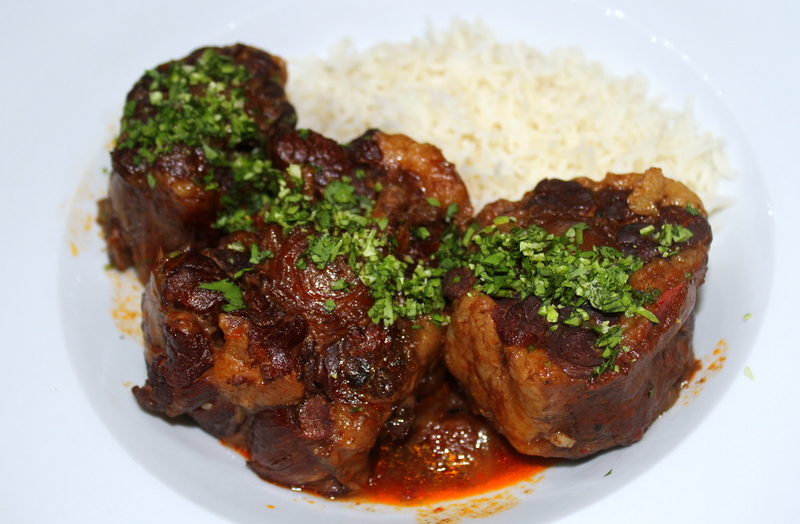 But, instead of a chuck I chose to go with oxtails – the tail of the cow – which is rich in collagen, rich in flavor and requires a good long braise. To give the dish a bit of elegance I did two things: take it from a stew to a plated dish and pair it with a cilantro gremolata. Gremolata is a classic Italian chopped herb condiment usually made of lemon zest, garlic and parsley. 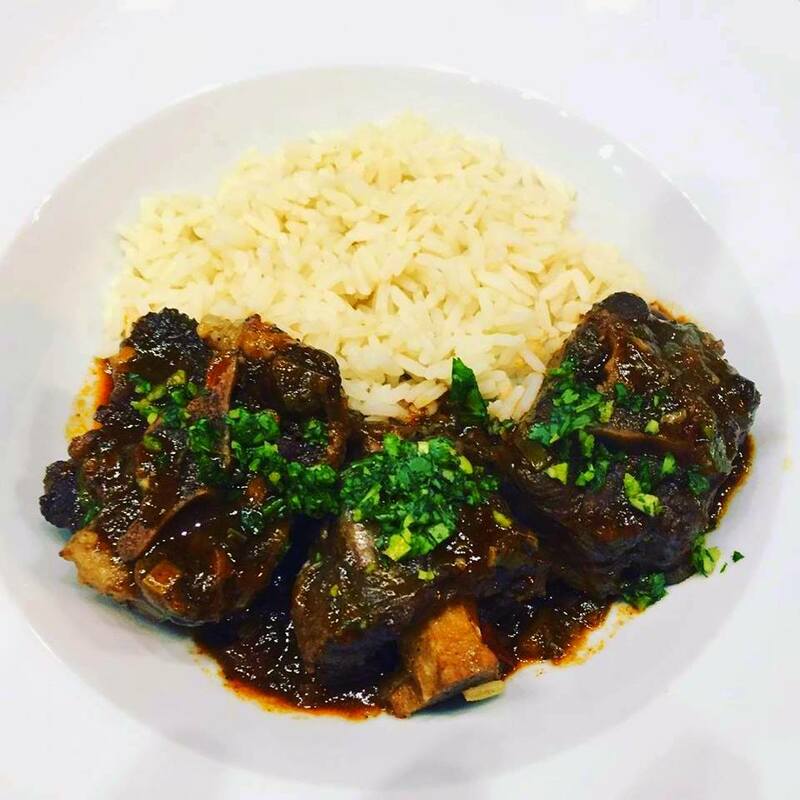 I thought a Mexican-style gremolata would play well with the richness of the oxtails while highlighting some of the flavors of the birria itself. I substituted lime for lemon and cilantro for parsley. Make the chile paste. Preheat a frying pan over medium heat. Cut the ends off the chiles, removing the seeds as you do so. Toast the chiles in the pan until they “brown” slightly, flip them and d toast the other side. Place the chilies in a deep bowl and cover with hot water. Soak the chilies for half an hour until they are tender. Remove the chiles 20 to 30 minutes until they are tender. Remove the chilies from the soaking water and place in a Vitamix or other high speed blender with the vinegar and process to a smooth paste. Cook the “Birria”. Add the onions, fennel and carrot to a large heavy pot, season them with Kosher salt and freshly ground pepper. Cover the pot and sweat the aromatics for five minutes. Meanwhile grind the remaining spices thoroughly. Season the oxtails with kosher salt and freshly ground pepper and add them to the pot. Strain the ground spices and sprinkle them over the oxtails. Cover the shanks with water and turn the heat up to high. Bring the pot to a boil and immediately reduce the heat to a simmer. Simmer the shanks for one and a half hours then add the chile paste to the pot. Continue braising for another hour and a half, until the meat is falling off the bone. Make the Birria reduction sauce. Combine the shallots and 2 cups of the birria braising liquid (defatting first if necessary) in a small sauce pan. Bring to a boil, lower heat to a simmer and reduce by half. Make the Gremolata. Using a zester, remove about 1 teaspoon of lime zest and finely mince. Keep in mind that the zest is the outer peel of a lime, not the inner white pith. Be careful not to include any of the pith below the skin because it is bitter. Combine the minced lime zest with the remaining ingredients in a bowl and season to taste with Kosher salt and black pepper. Plate the dish. 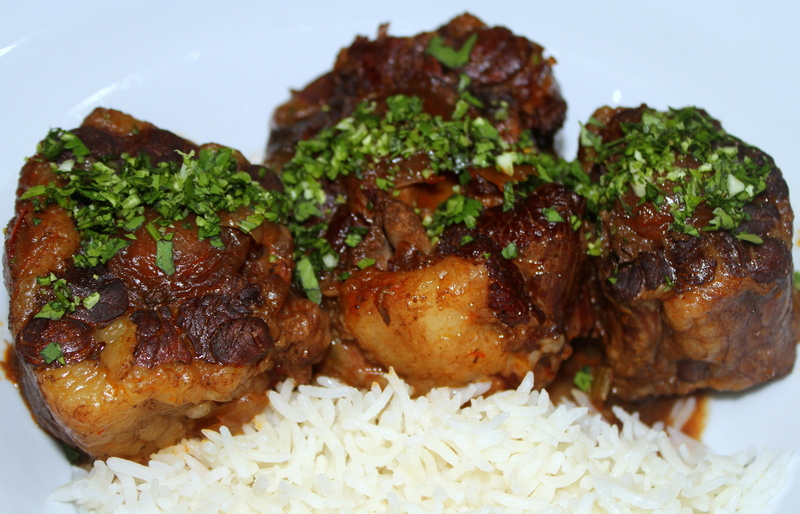 Serve three oxtail segments per plate over the rice. Spoon the reduction sauce over the oxtails and garnish with the cilantro gremolata.